Have you got the tools for the job? Technology strategy was pioneered in the chemical and high tech industries, as a way to deal with critical and complex technology planning problems. nu Angle built on these approaches and has developed a process that can be used within any industry. It is firmly grounded in the commercial needs of the business and allows a portfolio of technologies to be assessed at a business unit level or at a corporate level, to identify common technology platforms and evaluate their performance. Make the right investment decisions to create a viable and protectable pipeline of products. Understand the ROI for different technology investment options. Select technology investments that fit best with commercial and brand strategy. Reduce effort wasted on technology development with peripheral impact on the business. Protect future growth by identifying potential disruptive technologies. 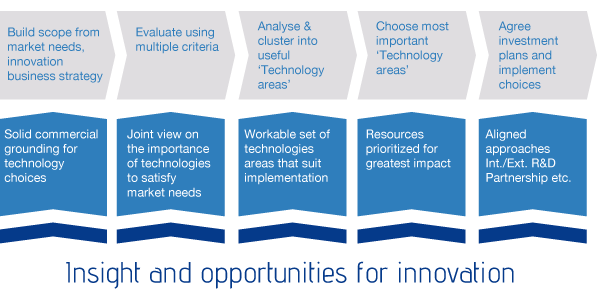 Identify external solutions that allow new, smarter products to be developed through ‘Open Innovation’. Spread risk and avoid putting ‘all the eggs in one basket’. To further support our clients, nu Angle has encapsulated its methodology within a bespoke Microsoft Excel application called nuTechStrat. This allows the client to input information about internal and external technologies and score them based on a number of metrics. This process will help to define investment plans, identify business critical applications and also reveal gaps in capability.